This is a piece of equipment you must have if you are an automotive locksmith, Car Repair shop, Car Accessories or even Car Dealer. The AD100 easy connection to the vehicles serial diagnostic port and easy to use instructions makes the system easy to use and a very powerful and is ideally suited to vehicle locksmiths and security professionals. 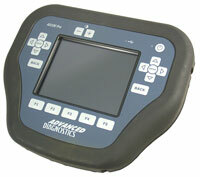 The AD100 offers an extensive software applications portfolio, and is constantly being updated. The AD100 now opens new opportunities for anyone involved in Vehicle Immobiliser Systems, Transponders, Key cutting and programming. The AD100 diagnostic system is a requirement for dealing with the latest vehicle technology and immobiliser systems, and without this equipment then vehicle repair work cannot be completed. Enhancing the highly successful AD100, was not easy, however the AD100Pro extends the boundaries even further. The AD100Pro now benefits from a large LCD touch screen/versatile keypad for easy navigation/selection, and a USB interface for fast software downloads. AD100Pro has been designed with simplicity in mind and the variety of adaptors required for AD100Pro have been integrated within simple colour coded dongles that configures the tester, thus reducing the quantity of cables required. Although only fitted to a few US vehicles at present, a new vehicle interface ¡®Single Wire CAN¡¯ has been added to the AD100Pro, along with all the standard interfaces, plus the CCD and VPW protocols. Combined with enhanced security and increased memory capacity, the AD100Pro positions itself as the leading transponder key programming tool in the world. The security of the AD100Pro is of great importance to us. If the unit should fall into the wrong hands it can be a powerful asset to a vehicle thief. Every AD100Pro has an individual serial number and a record is kept of each owner. The AD100Pro has a user ID protection, before the AD100Pro will operate a 6-digit code must be entered, after a few incorrect attempts, the AD100Pro corrupts the memory and has to be returned for reprogramming. When purchasing new software, the system will only upgrade if the tester is of the correct serial number. Therefore if the tester falls into the incorrect hands, the unit can never be upgraded.